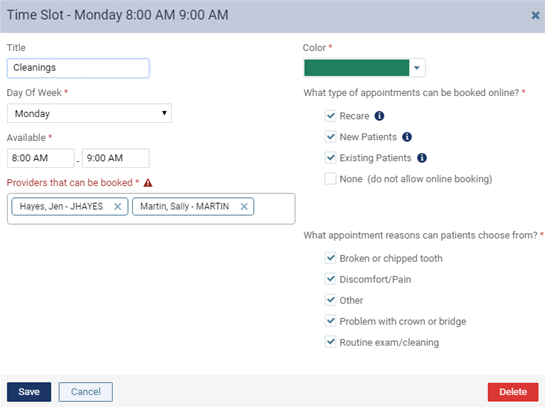 To allow patients to book appointments online, you must set up time blocks that specify which types of patients can schedule appointments, when and with whom they can schedule them, and the appointment reasons that they can choose from. Recare - To allow patients to book online when they receive email and text message reminders. New Patients - To allow new patients to book online using your practice's website. Existing Patients - To allow existing patients to book online using your practice's website. What appointment reasons can patients choose from? - At least one of the appointment reasons.